"The key—to have children be so entranced by the books they read that they will be a reader for life." Groundwood Books is a Toronto-based publisher of children’s and young adult literature. The press was founded by Patricia Aldana in 1978 and almost from the start has been publishing Canadian literature alongside titles from around the world in translation. Groundwood’s catalogue includes books from Egypt, Mexico, and Mongolia, to name a few, and the press is particularly interested in publishing marginalized and underrepresented voices. Though Aldana sold Groundwood to House of Anansi Press in 2012, she remains active in the area of children’s literature. 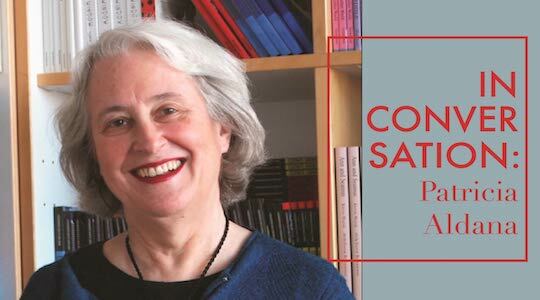 She is currently president of the International Board on Books for Young People (IBBY) foundation and collaborates with the China Children’s Press and Publications Group, where she is responsible for bringing international literature to Chinese children. In an interview that took place in Buenos Aires during the TYPA Foundation’s workshop on translating literature for children and young adults, Aldana spoke with Asymptote’s Editor-at-Large for Argentina, Sarah Moses, about the qualities she looks for in books for children and the challenges of translating for young readers. Sarah Moses (SM): When did Groundwood Books begin publishing children’s and young adult literature in translation? Patricia Aldana (PA): Quite early, by 1981, I started doing translations of books in French from Québec. There were subsidies for translation from the Canada Council, which made it easier—especially novels. I was also going to Bologna and selling rights, and there I started finding books from other languages that were interesting to translate. The Canadian market was quite healthy at that time and you could bring in books from other countries. But in 1992 provincial governments started to close down school libraries which affected the entire ecosystem of the Canadian market and we had to go into the U.S. market directly and publish books there ourselves. A lot of our authors were known in the States because we had sold rights to them, to compete with the U.S. giants and to differentiate ourselves from them as by that point they had virtually stopped translating anything—we seized the opportunity to publish translations for a much bigger market. The Canadian market had deteriorated to such a point by then that it couldn’t really justify publishing a translation—other than of a Canadian author from Québec. SM: What was the experience like? How were the books in translation received in the U.S. market? PA: It was really what made us known. Now there’s Enchanted Lion, a U.S. children’s house, which has sort of followed our model, but we really were the only ones at that point doing any kind of translating. Beginning in the mid-1990s, let’s say, the U.S. houses had pretty much stopped publishing translations. The structure of the industry became more and more based on bestsellers. There were huge consolidations in the industry. The power of the editors really diminished; a lot of the editors stopped going to Bologna. One person told me it was too seductive to go to Bologna and see these beautiful foreign books because they were not going to be able to sell them. Whereas for us, it’s what made us special; it gave us a reputation. Books that were on The New York Times Best Illustrated Children’s Books of the year were often translations. So for me it became a fundamental part of our business—Groundwood was the publisher of books from all the world. And I personally had a special interest in books from Spanish. So very early I started publishing a lot of original books in Spanish and buying from small Latin American publishers; that’s why it became such an important part of our publishing program. SM: I’m interested in the process of selecting books from languages and parts of the world that you’re not familiar with. How did you go about discovering books for Groundwood? PA: Partly because I was traveling for IBBY all the time and my contacts through IBBY are people with very demanding standards. I would go to a country like Iran and someone would say, “You ought to publish this book.” They would give me a rough translation and I would say, “You’re right, this is an incredible writer.” I went to Japan and I found an incredible book from a very small Mongolian publisher. I never would find these kinds of titles in a fair or on the market. So it was a huge advantage for me to be so involved in IBBY because I really was on the ground in a lot of places. That is where I found a lot of the good, interesting books that kind of really caused a stir—because I’d been able to find them in places that other people weren’t looking at all. I also can read all the romance languages, which is a big help. But I can’t read Iranian or Hindi or Tamil or Mongolian. SM: What would you say makes a book for children or young adults incredible? PA: For me it’s the story. Of course it has to be a beautiful book, but there are lots of very beautiful books that are completely hollow and empty and just published for their graphic wow factor. Especially in Europe, I would say, there are a lot of books that aren’t of deep, lasting content although they look great. The content really is important to me—the story needs to have a reason to exist. It has to be original, something that isn’t there already. So many children’s books are the same as each other. So many of them are repetitive and derivative and formulaic. And so if I looked for a book, it had to have something that was really going to be illuminating in a different way, from any other book I’d ever seen. And that was really from that culture—something you would never otherwise know about that part of the world. SM: Would you say your criteria for selecting books for Chinese kids is the same as for North American children? PA: Yeah, I’d say so. It’s pretty much the same. I have often had to fight really hard to get a book into that market. But often I get my way. They’ve recently bought a graphic novel they really were nervous about, called Malko y papá, by Gusti. It’s an autobiographical book. Gusti has a child with Down syndrome. He was very upset when the child was born but as Malko grew up, they became best friends. It won the big prize at Bologna, and it’s just an exceptional book about the relationship between Gusti and his son, their friendship, and it’s beautiful. In China they’re really ambivalent about people with Down syndrome, to say the least. Getting them to take that book was a real triumph. It’s really important that books have meaning. We just don’t need a whole bunch of nothing books. In China right now, they’re publishing fifty thousand children’s books a year. Well, forty-eight thousand of them probably don’t merit being published. The same is true in the English speaking world. Once you have that kind of production then you bury the good books—they’re really hard to find in the market. I never wanted to add to the product. So I wasn’t looking for bestsellers and stuff like that. SM: I suppose with a rough translation you get the gist of the story and that’s sufficient to know if you’d be interested in publishing it. PA: Especially with a picture book. Novels are much more expensive and risky if you can’t read the original language. Groundwood published a Chinese novel called Black Flame. That was a very complicated process. There’s no money from China to subsidize translations to speak of—I think the publisher gave us a thousand dollars or something. It’s a big novel and we tried four translators. None of them could write a children’s novel. SM: When you say none of them could write a children’s novel, what do you mean exactly? PA: Well, we ended up with a British literary translator, but she was not a children’s book translator and she was translating as though it was an adult audience. It’s not that it’s lower quality or less literary, it’s that it’s a different genre, a different voice. I’ve been talking a lot about that—voice is everything. And she didn’t know how to do a voice that would be engaging—these are books for 12-year-olds. She was very concerned with the literary quality, which is important—and is very important for us too—but her first draft wasn’t a children’s novel. We probably lost about one hundred thousand dollars on that book. But it was the first Chinese children’s novel published in English. And it was important to do. It’s a good book. SM: I’m wondering what specific problems translating children’s literature presents. Would you say capturing a child’s voice is the most important thing? PA: I think for any book, of any genre, you need to be convincing. A book has to convince the reader that it’s believable: it’s something you can give yourself to because you don’t feel manipulated or cheated or that this is some kind of a false picture of whatever it is that you’re being presented. So I think that voice is the key factor. For me, a book in the first person, from a child, really needs to be in a child’s voice, which is very different if the child is living in Iran or if they’re living in Guatemala, let’s say. But you still believe that this is a child and that the story the are telling is seen through their own eyes. And then the tone of the story, all the different feelings that the story needs to show—that’s very important too. I think you should stay as true to the author as you can in your translation, but you also have to find a way to make that voice work in the other language and that’s not always easy. That’s why I feel okay about taking a rough translation into English and working with it to make it work in English—even if it’s not an absolutely literal translation. As long as it’s totally true to the original feeling and voice of the original book. SM: Do you often work with translators of children’s and young adult literature specifically? PA: Yes, I try to work with people that have experience with children’s books because just as children’s writers are writing for children—it’s the same with translators. If you don’t have the child reader in mind then your not creating children’s books. You might be doing beautiful books that are very designy and gorgeous, but if you’re not interested in the child reader then you’re not really a children’s book publisher. We in IBBY believe that every child should have a chance to be a reader. That’s what great books give you is that love for reading. That’s the key—to have children be so entranced by the books they read that they will be a reader for life. SM: Would you say there’s something that unifies the children’s literature published in a particular country? PA: Yeah, Iranian books are extremely sophisticated. They’re meta texts; they’re very literary; they have extremely sophisticated art—much more sophisticated than most books in the west. And people hardly ever get to see them. Swedish books are very particular. In fact, I did have to stop going over to Swedish publishers’ stands because I bought a lot of them that I loved and they were all disasters because in the North American market they just considered them to be too weird—the people look weird; they’re lumpy; they’re strange. I bought a wonderful book called Else-Marie and Her Seven Little Daddies. It’s about a little girl who has a nice big, fat comfy mother and then she has seven little tiny daddies and they take her to daycare and this is what makes her different from other people. Then there’s this great scene where the mother and the daddies and the little girl are in the bathtub and the mother’s reading to the little girl and we would have been accused of total God knows what if we’d published that illustration! People look at it and they say it’s just too weird. SM: Can you recommend a few titles that you love or were really excited to publish? PA: I did a great book that didn’t sell well, but that I really loved doing, When I Was a Boy Neruda Called Me Policarpo, by Poli Delano, who was a childhood friend of Neruda’s when he was a child. His parents were in Mexico when Neruda was the ambassador there and he grew up in the very eccentric Neruda household. And Neruda named him Policarpo. It’s a really nice memoir of his relationship with Neruda. It’s such a good book, but it didn’t really go. It had some of Neruda’s poetry and I just thought it would be a great introduction and it was so charming. An incredible book that I published from Pastèque in Québec is called Harvey, which is about a little boy who comes home to discover that his father has just died. He’s very interested in the movie The Invisible Man, and that appears in the book. Then when his father is being buried they keep trying to get him to look into the coffin and he keeps hearing all these adults talking about his father. His uncle finally picks him up and makes him look in the coffin, and then he disappears and that’s the end of the book. It’s so brilliant about death and loss and grief. The Black Book of Colours was a New York Times Best Illustrated Children’s Book. That was quite a complicated book. It’s a very short text. It’s a book that has Braille in it that you can feel, and the illustrations are printed in a kind of elevated ink. It’s supposed to help the sighted child figure out what it would feel like to be blind, and it talks about color from the point of view of a blind child. That was a book from Ediciones Tecolote and it’s quite a fine book. We published some really good books from a Mexican editor called CIDCLI. The Poet King of Tezcoco was a book about a poet who was one of the last Aztec kings. He was a monotheist and a pacifist. It’s an illustrated biography. It’s a pretty wonderful book, too, and it was quite an interesting challenge translating it. We also did a book on La Malinche, an ambivalent figure from the history of Mexico. The Aztecs had captured her. She was the daughter of a non-Aztec king and she aligned herself with Cortés as a translator and as an advisor. She helped him defeat the Aztecs. She was his lover and had what’s supposed to be the “first” Mexican, a child of mixed race. So she’s a very interesting figure and that was a very interesting book too. These titles were written by eminent Mexican author Francisco Serrano. We published The Illustrator’s Notebook by the most important Egyptian illustrator, Mohieddine Ellabbad, who recently passed away. It’s literally an illustrator’s notebook and explains how he found his own voice and style as an Egyptian, rather than following western models. He learned to find his own sources to do cats—like Egyptian-type cats, not western-type cats—or use Egyptian heroes, not heroes like Superman, and used postcards to imagine worlds that he could illustrate. His own Arabic notebook is at the center of the book and then the translation is along the side. We published that partly because after 9/11 we really wanted to have Arabic in a book and have more books from the Middle East in the English speaking market. It’s also a terrific book. Sarah Moses is a writer and translator. Her work has appeared in chapbook form, as well as in various journals, including Brick and TNTR. Sarah divides her time between Toronto and Buenos Aires. She is also the Asymptote Editor-at-Large for Argentina.